More than 2000 monks and nuns from different part of the world and country joined the Sanghadana 2018 (Charity to the community of monks) organised by Mahabodhi International Meditation Centre in collaboration with Chung-Hwa International Merits Society of Buddha-Puja and the Buddhist from Taiwan on September 17 at MIMC, Choglamsar. 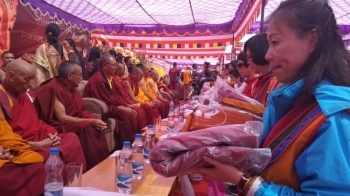 Chief guest, Venerable Shatup Chamba, President Ladakh Gonpa Association, thanked the donors, and the organising committee for organising this Sanghadana in Ladakh. She further said that in the near future they will be back to Ladakh to organise the same and informed that on 25th of August next year, they are going to organise Sanghadana at Taipei and invited all the sangha of Ladakh for it. Venerable Ming Yu, President Young, One of our venerable from Taiwan has been coming to Ladakh in 1996, 1997, and 1999 to perform. It is with auspicious opportunity that we are able to perform sanghadana here in Ladakh once again after 19 years, which is a miracle of its own. Sanghadana is extremely good and the merit occurred from this act knows no limits, hence we would like to share this merits to all sentient being. At the end, Bikkhu Sanghasena honored those who have contributed in organising the Sanghadana 2018.